It seems that Government inquiries into early childhood education and care are like Star Wars movies. You spend ages waiting for one to come along, and then all of a sudden three are announced at once. As well as the high-profile Productivity Commission inquiry into the sector, there are also two separate Senate inquiries running concurrently. 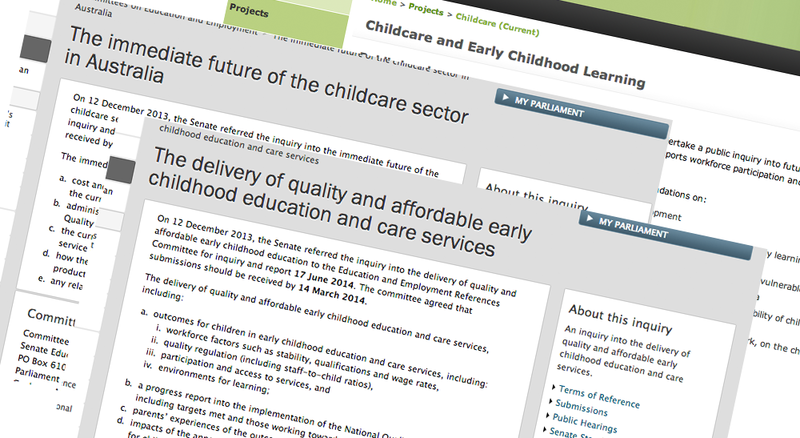 Three significant and investigative examinations of Australia’s childcare sector. Clearly there is a huge gap of knowledge in how to best fund and manage childcare in this country, right? There has never been more global attention on the need for investment and serious political focus on the provision of early learning. From James Heckman’s ground-breaking research in the United States, to the OECD’s own global economic assessments, and analysis of our own long-term data around children and families such as the AEDI, the evidence-based argument for investment has all but been won. Ever since Tony Abbott announced his “signature” Paid Parental Leave policy, he’s been told left, right and centre that if he really wants to make an impact on women’s workforce participation, then $5.5 billion would be far better directed into childcare. Three inquiries, or thirteen, or thirty, won’t tell us anything we don’t already know about investment in the early years. The inquiries aren’t about the economics of the issue, but about the politics. Particularly with the Productivity Commission Inquiry, the Government has already stated that increased investment is off the table. This is stunning, given that the major reform that is needed is significantly more investment. The inquiries will all have similar recommendations – a reformed system could have incredible benefits for children, families and communities. But the Government has already let us know that is not going to be happening. They can hold all the inquiries they want, but until funding childcare becomes a budgetary priority, fiddling around the margins will have marginal impact. But don’t take my word for it. Feel free to hold an inquiry or three.